"How Cross Border Shippers Can Improve their Supply Chain Organizations"
Operating in a world where global supply chains are becoming increasingly intertwined and complex, today’s shippers face a litany of challenges when importing and exporting goods. The current tariff environment, transportation capacity crunches, rising freight rates, and the North American truck driver shortage are just a handful of the key issues that all shippers are facing. 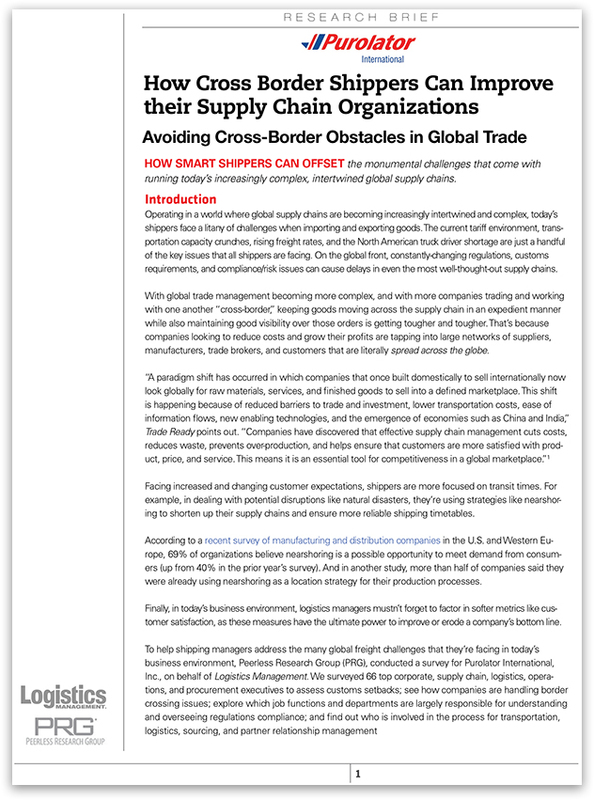 On the global front, constantly-changing regulations, customs requirements, and compliance/risk issues can cause delays in even the most well-thought-out supply chains. With global trade management becoming more complex, and with more companies trading and working with one another “cross-border,” keeping goods moving across the supply chain in an expedient manner while also maintaining good visibility over those orders is getting tougher and tougher. That’s because companies looking to reduce costs and grow their profits are tapping into large networks of suppliers, manufacturers, trade brokers, and customers that are literally spread across the globe.